Patricia Black with Nephew Benjamin Hawkins, Jr.
Six year old Patricia Ann Black (1956- ) with her two year old nephew, Benjamin Hawkins, Jr. (1960-), in 1962. 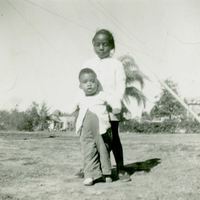 The two children are pictured in the front yard of the Black family home located at the corner of East Tenth Street and South Bay Avenue in Georgetown in Sanford, Florida. Hawkins is the son of Patricia's oldest sister, Vivian Louise Black (1940- ). As an adult, Hawkins moved to Rochester, New York. Original black and white photograph, 1962: Private Collection of Patricia Ann Black. Digital reproduction of original black and white photograph, 1962. The Magazine of Wayne County History, Vol. II, Iss. I, page 2. Originally owned by Pilgrim Black. “Patricia Black with Nephew Benjamin Hawkins, Jr..” RICHES of Central Florida accessed April 20, 2019, https://richesmi.cah.ucf.edu/omeka/items/show/2684.